I could not wait to try this new stamp. It is fun to emboss and cut out flowers. 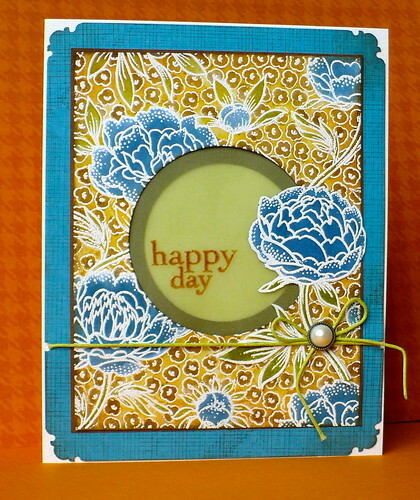 I white embossed the Large Flower Background (Hero Arts) and colored it with distress inks, water and a paint brush and to deepen the blue I rubbed in more ink and distressed the edges with the Walnut stain. I liked the blue background panel color but it needed some toning down. I did it by stamping Envelope pattern (Hero Arts) with Walnut stain. I cut a window and covered it with green vellum with a clear embossed sentiment. For the first time I used a small tip - with the help of a crop-a-dile I cut small slits on the edges of the card to secure the twine. My men really liked the colors. I do too! I am entering it into Hero Arts March contest. Beautiful card dear Maria! I love the rustic feel it has!